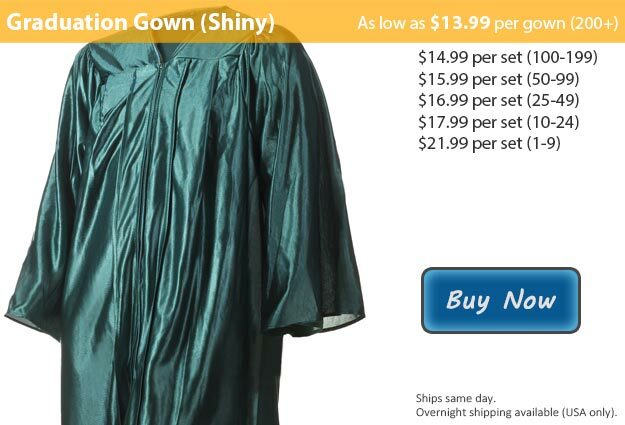 Shiny forest green graduation robes are the perfect outfit for a celebration! And, after you have finished so much hard work over these past few years thanks to your consistent dedication, it is safe to say that a celebration is in order! Your graduation is a time when your friends and family come together from all around, specifically to honor you on your success and give their support to you on your future endeavors. Reaching this point was not an easy task, you were faced with countless challenges that you had to endure all the way to the end. As you finish this portion of your life, your graduation marks the beginning of your next chapter. Even though it may have been difficult I'm sure that it wasn't all bad, be sure to pause for a moment and reflect on all of the great friendships and lasting memories that you created along the way as well. Graduating students dress in a cap and robe for their graduation ceremony and typically accent their outfit using graduation tassels or cords. This has been the tradition for many years and here at Honors Graduation we have everything that you might want or need to be ready for your big day. Our shiny forest green graduation gown along with the matching cap is a sleek way to go, it is the perfect backdrop color for many of our graduation cords and tassels. Our graduation gowns are available for purchase separately or as a part of our cap & robe + tassel bundle. Whenever you buy a graduation cap from Honors Graduation we'll toss in a tassel set of your color choice at no additional cost to you. Each of the shiny graduation gowns that we have are also available in matte if you prefer. Gown color is usually determined by your school but whether it is your choice or not we have a large selection of colors and sizes to accommodate for your needs. This graduation gown is also available in Forest Green Matte Fabric.